This happy oblivious fool is caught in the moment just before the board he's standing on breaks. He doesn't notice that the hidden "Ace-up-his-sleave" is showing, and his "never-ending scarf trick" is spilling out, his monkey partner (wearing a jacket and a fez)is dipping his own Pewter Cup into the drink, and more. 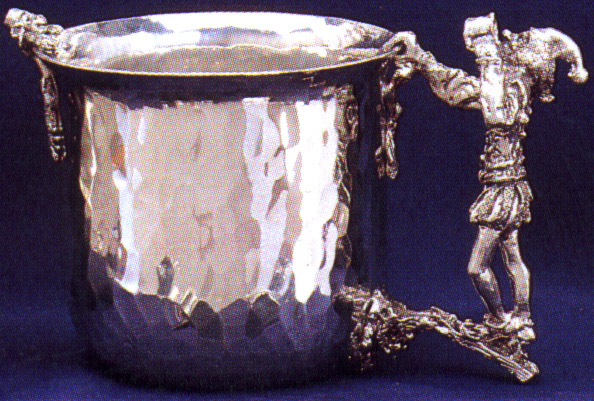 The Pewter Cup is 3 3/4 inches across at the rim and holds 14 ounces. We make it by hand from lead-free pewter so it's suitable for all liquids. Keeps your ale cold (and your coffee maybe too hot)!